“I lost my speed,” says a surprised Flash (Grant Gustin). “What do you mean you lost your speed?” asks a confused Joe (Jesse L. Martin) “Uh guys, I think I found it,” says a shocked Iris (Candice Patton) as she watches her hand vibrate with intense speed and energy in season four episode 16 of The CW’s The Flash. As the episode begins, Harry (Tom Cavanagh) and Cisco (Carlos Valdes) are brainstorming at 1:01am on how to find the other bus metas before DeVoe does. Cisco’s exhausted so he calls it a night and tries to get Harry to do the same, but Harry’s determined to stay until he comes up with an idea. By pulling an all-nighter, Harry decides to go over the footage of the particle accelerator explosion and sees video of DeVoe getting hit by dark matter while wearing his thinking cap device. Harry decides to build his own thinking cap and wants to replicate the process DeVoe underwent, making him smart enough to out-think the evil mastermind. When Harry presents his idea to Team Flash the next morning, the gang’s hesitant to go forward with it because they’re worried about Harry’s safety. Finally, Iris, Barry, and Caitlin (Danielle Panabaker) decide it’s worth exploring. However, Cisco shuts down the idea bringing up the experiment warped and changed DeVoe from being a loving husband and devoted professor to the self-absorbed, evil mastermind he is now. Ralph (Hartley Sawyer) gets upset they aren’t going to explore the idea because he knows DeVoe is after all the bus metahumans, including him. When he walks off brooding, Iris catches up with him to give him a pep talk. It fails because Ralph points out she doesn’t know what it’s like to be out in the field risking your life to save people. She’s always safe back at S.T.A.R. Labs playing team leader. Meanwhile at a Central City bank, a meta with the power of fire is trying to hold up the bank. A young man tries to talk him down and tries to change his mind. The man touches the fire meta and gets tossed backwards. But simply by touching the bank robber, he removes his powers and accidentally transfers them to one of the citizens in the bank just by falling into him. The bank security guard tackles the meta and stops the robbery. A little while later, Joe and Cisco are investigating the robbery and are quick to realize the man in custody is the would-be robber but that his powers are now gone. Back at S.T.A.R. Labs, Caitlin’s theorizing how the meta lost his powers when Cisco realizes looking at the bank video footage that the mystery man who was gone before Joe and Cisco arrived might be a new meta who took the fire meta’s powers. He cross-references his image in the video and identifies him as Matthew Kim (Leonardo Nam), a Central City EMT. Joe heads out to talk to him and Iris says she’ll tag along to help, a move that surprises Team Flash. When Joe and Iris talk to Matthew, he panics believing they want to take away his powers. He grabs Iris and holds her at knife point. Joe sends an alert on his phone and The Flash speeds there to stop him. The Flash shoves Matthew away from Iris but by doing it Kim accidentally transfers The Flash’s powers to Iris. At S.T.A.R. 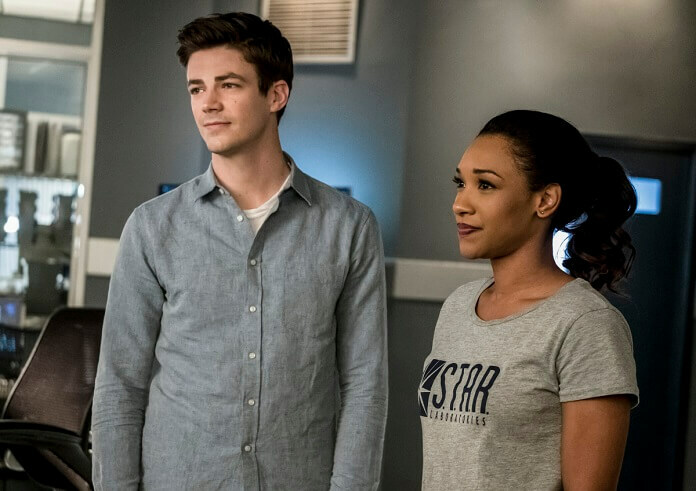 Labs, Caitlin runs tests and tells Team Flash that for now Iris has Barry’s powers and Barry is back to being his normal human self. Barry asks if she can find a way to reverse it and Caitlin says she’ll try. In the meantime, Barry tells Iris he’ll train her to be a speedster. Harry approaches Cisco to help him with his thinking cap creation and again Cisco refuses. An upset Harry storms off. Caitlin, who was in earshot, confronts Cisco and tells him he should help Harry. Cisco reminds her of how the experiment changed DeVoe’s personality, but Caitlin points out Harry’s going to create it with or without him so he should help and make sure it doesn’t happen to Harry. 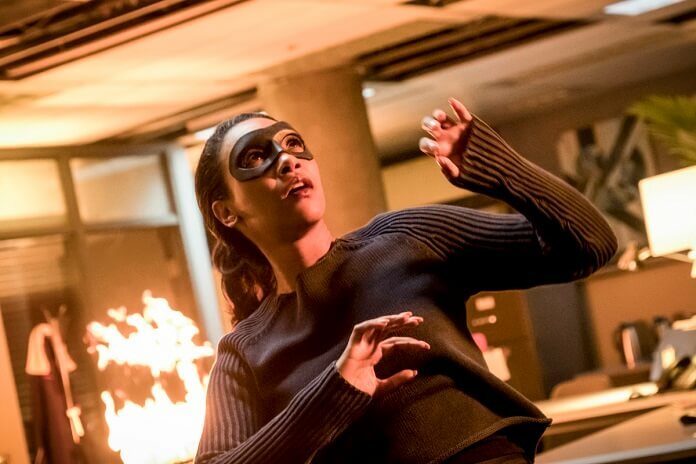 Barry’s sulking about losing his powers and Iris assures him Caitlin will find a way to fix it when Caitlin calls both of them about a high-rise fire and people being trapped. Iris speeds out to save the day using a mask Jesse Quick used to wear. With Barry’s coaching, she’s able to get the five residents out but when she goes back in to put out the fire creating wind tunnels as Barry has done time and time again she does it wrong. She makes the fire worse and a beam collapses on her, trapping her. Barry tries to tell her to phase through the beam and she has to reach down inside herself and feel it, but the scared and inexperienced speedster begins to panic. Realizing she won’t be able to do it, Cisco breaches into the building grabs Iris and breaches them back to S.T.A.R. Labs. (Hello…Cisco should have breached Killer Frost into the building so she could put out the fire and Iris should have stayed back at S.T.A.R. Labs). A little later, Caitlin again encourages Cisco to help a struggling Harry with his thinking cap, giving him the Caitlin “puppy dog eyes” look which Cisco can never say no to. He tells Harry he’ll help him but that he has to promise not to use any dark matter which he agrees to. Iris is running around the speed lab to burn off steam and admits to Barry she feels the need to prove to herself she can be fearless like she once was. Another call comes in about a new fiery meta outside the same bank. Team Flash sees Matthew’s there to try to take away the meta’s powers. Barry suggests that Cisco and Caitlin handle this but Iris assures them she will handle it. As she’s about to go, Cisco pulls out a new speedster suit. Iris speeds into it and off to the bank. Matthew tries to stop the meta but almost gets roasted alive. Thankfully, Iris grabs him and speeds him out of the line of fire. She puts the power-reducing cuffs on him and faces off with the fire meta who starts shooting fire at her at a temperature of 800 degrees (the same temperature as lava). The fire meta makes a thermo-cyclone that threatens to destroy nearby buildings. Iris again starts to panic asking what she should do. Harry uses his almost finished thinking cap and comes up with an idea. Iris needs to run on water on the nearby bay and create a tidal wave to put out the tower of fire. At first, Iris says she can’t but Barry is successful in convincing her she can, promising he’ll talk her through it. Iris speeds across the bay with Barry’s coaching and she’s able to create the huge wave which douses the fire. Back at S.T.A.R. Labs, Matthew apologizes for the chaos he created and returns Barry’s powers to him. Iris admits it was fun to run on water but will be happy to get back behind the desk at S.T.A.R. Labs. Barry races around a few times to make sure he has his powers and Cisco declares, “My boy‘s back!” Team Flash talks to Matthew about joining them in their fight against DeVoe and he agrees, asking, “How do we start?” Cisco starts by giving him a tour. Iris reaches out to Ralph to stay close to Matthew saying he’ll need a buddy. Ralph apologizes to her about what he said earlier about not risking her life. At their apartment, Barry double checks with Iris being okay with not being a speedster anymore. She tells him he was always meant to be The Flash with his desire to help people and being the light for everyone when all goes dark. She confides that her strength is her writing and tells him she’s going to go back to being a journalist. The final scene shows Harry and Cisco working on the thinking cap. Harry outs it on and Cisco wants to turn it off, worried it’s been too long. After Cisco turns it off, Harry reveals he knows the names of the other two bus metas. More gimmick than substance, season four episode 16 titled “Run, Iris, Run” is a forced and contrived outing front-lining Iris as the new hero of Central City while benching Barry, Killer Frost, and for the most part, Cisco. This is a poorly written episode with Team Flash encouraging Iris to race out and play hero with people’s lives while in other seasons of the series it would be weeks or months before they let a rookie speedster take on a crisis or villain solo. It just doesn’t ring true to what Team Flash has done in the past with new speedsters like Kid Flash or Jesse Quick. The scene where Iris races off to save people from a fire after barely getting her new powers also lacks any common sense and logic. It’s so obvious Vibe and Killer Frost could have easily saved the residents and put out the fire as a team. The one thing this episode does prove is that the writers and showrunner don’t seem to know what to do with the character Iris West. Keeping her as Team Leader doesn’t make any sense with Barry and Harry both at S.T.A.R. Labs. What might be best is to let Iris go back to being a journalist and have her own storyline separate from Team Flash, similar to what they did with her in the first two seasons of the show. With Harry identifying the last two bus metas and with Matthew joining Team Flash to fight DeVoe, it should be very interesting and exciting to see what Team Flash comes up with to stop the evil mastermind.